P&O Cruises | Frequently Asked Questions | On Shore - What will happen to my shore excursions if my cabin changes? You are here: Home > Advice centre > Shore Excursions > What will happen to my shore excursions if my cabin changes? Q. What will happen to my shore excursions if my cabin changes? Our systems will automatically be updated with this information, you are not required to action anything onboard. 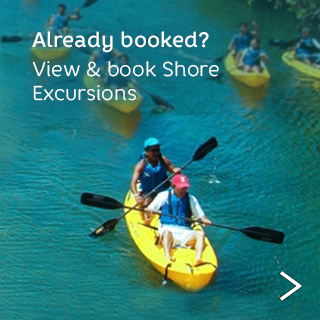 Your shore excursion tickets will be automatically sent to your cabin on embarkation day. If your tickets have not been delivered within 48 hours of embarkation, please go to the Shore Excursion Desk with your booking confirmation where they can be reprinted.